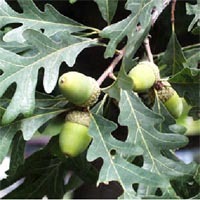 Medicinal and other uses: The acorns were leached of tannins and eaten, often ground into flour. The bark was one of the ingredients in the Saanich ‘4 barks’ medicine used against. Cautions: None stated tuberculosis and other ailments (Pojar 50).